Those who have recently moved into a small apartment may think that there are few upgrades they can make that adhere to their rental agreement, especially when it comes to the bathroom. Luckily, there are a number of bathroom accessories that can give a washroom an upscale quality and improve its utility in the process. 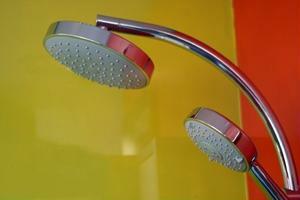 One of the biggest aspects of a new showerhead is that it will improve your bathroom's aesthetics drastically. You can get rid of that tired old faucet in your shower and replace it with a modern design that is available in a number of shapes and finishes to suit your décor. Most importantly, a showerhead will allow you to control the flow of water coming into the shower to your exact specifications. Whether you'd like a bit more pressure or an even amount of water coming through the showerhead, there's probably a device that will meet your needs. Updating the look of your apartment may be a daunting task, but there are a few quick and easy improvements that new urban dwellers can look into to that will dramatically improve the look of their bathrooms.